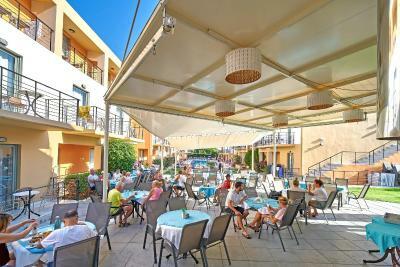 Lock in a great price for Sunrise Village Hotel - All Inclusive – rated 8.5 by recent guests! Staff were friendly, not much food, but very good food, the shows were interesting. We had beautiful spacious superior room with stunning views. 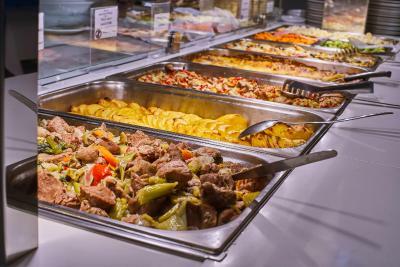 Wide selection of dishes, Greek and international. Very kind and helpful staff. 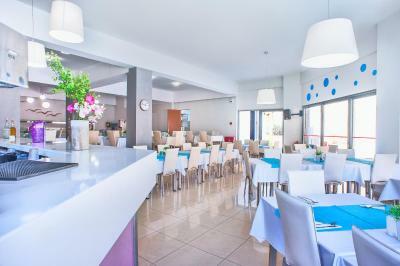 We had chosen this hotel having in mind that we wanted to completely relax after very busy working year and feel being pampered by all inclusive option offered for very good price. And to celebrate our recent engagement. We were not disappointed. All in all, we would come again. Great stuff, big rooms, 2 bathrooms. 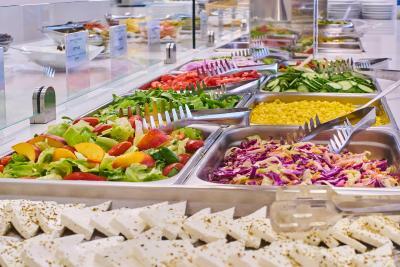 The place is clean and buffet food ia good quality with gluten free options available. Parking: plenty of spaces. Swimming pool open until 9pm, clean. Small children playground available. Staff were very friendly and fantastic with our two children. Food was nice and always a good choice for the adults. I really enjoy the location where you can see the sunrise and sunset over the beautiful Chania. You could catch a bus to Chalidon Street, where you can purchase tourist souvenirs and traditional food. The fish spa was a really good experience. The staff were always friendly without failure. 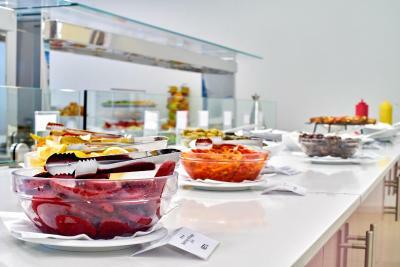 The food was really amazing, it was better than what I expected, buffet never disappointed. The buffet have good timing. The pool bar is nicee and small. The mini kitchen is good for cooking if you like. We enjoyed our time at Sunrise Village Hotel. All-inclusive was great, location good on a quiet side street yet short walking distance to the main street where the shops, taverns/bars are and the beach. Nice little supermarket next to the hotel with lovely shop manager. Special thanks to the hotel personnel they were most friendly and helpful especially the lady at the reception. Good quality-price ratio. 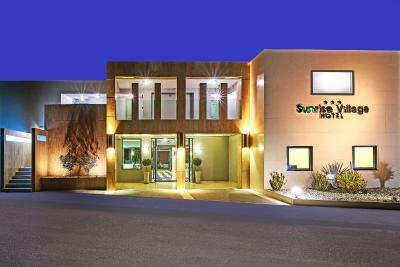 Sunrise Village Hotel - All Inclusive This rating is a reflection of how the property compares to the industry standard when it comes to price, facilities and services available. It's based on a self-evaluation by the property. Use this rating to help choose your stay! 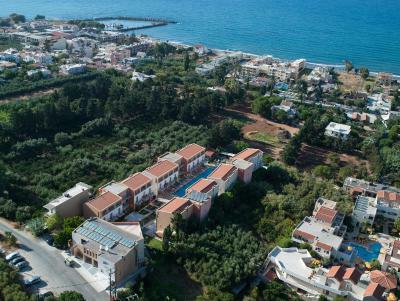 One of our top picks in Platanias.Sunrise Village Hotel is located 550 from the sandy beach of Platanias, only 7.5 mi from Chania on the highway to Kastelli. Free WiFi is provided throughout. From comfortable studios to spacious maisonettes, Sunrise Village Hotel’s accommodations is thoughtfully appointed. 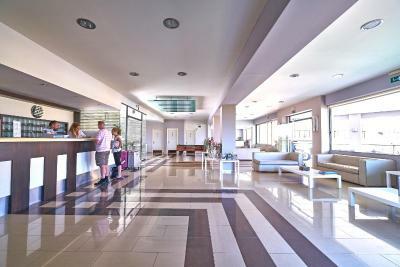 Along with free internet access and a tasteful and modern décor, each of the hotel’s rooms has plenty of space and includes kitchenette facilities. 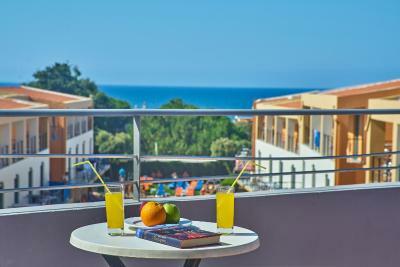 All rooms have balconies with sea view, air conditioning and cable TV, and a sitting area. 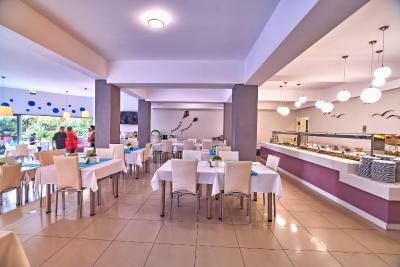 Sunrise Village Hotel’s facilities include an outdoor swimming pool with a pool bar, a restaurant and a bar. 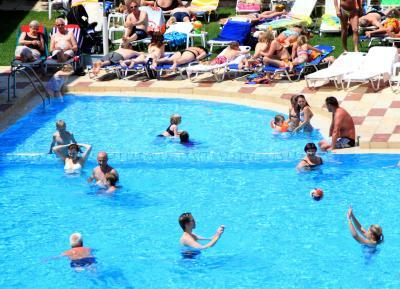 Pool and beach towels can be provided at an extra charge. When would you like to stay at Sunrise Village Hotel - All Inclusive? 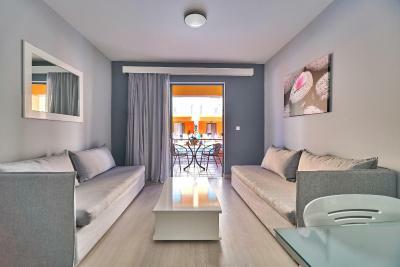 Opening to a balcony with views of the pool, this air-conditioned apartment consists of a separate bedroom and a sitting area fitted with purple sofas. Free Wi-Fi and a TV are provided. 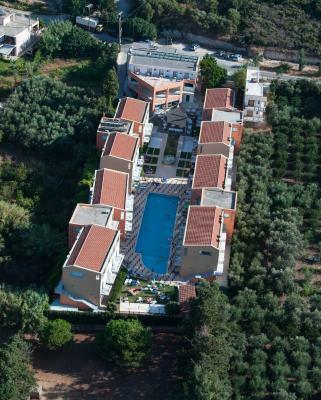 Opening to a balcony with pool and Cretan Sea views, this air-conditioned suite has 2 bathrooms and free Wi-Fi. A staircase leads to the upper floor with the bedroom. Opening to a balcony with views of the pool, this air-conditioned studio features a kitchenette, free Wi-Fi and private bathroom. 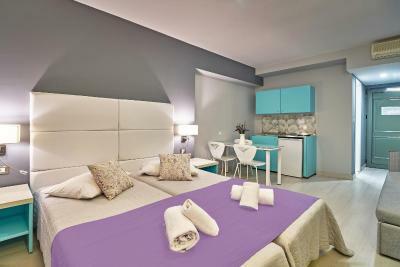 Opening to a balcony with pool and Cretan Sea views, this air-conditioned suite comes with 2 bathrooms and free WiFi. A staircase leads to the upper floor with the bedroom. Opening to a balcony with views over the sea, this air-conditioned studio features a kitchenette, free WiFi and private bathroom. 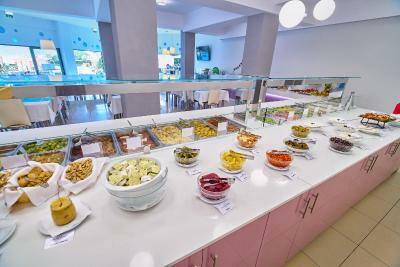 Hotel is located a bit up from main road to mountain side in local living area which is surrounded with lovely olive trees in a calm and relaxing area.Hotel is small all inclusive hotel kept by lovely Greek family. House Rules Sunrise Village Hotel - All Inclusive takes special requests – add in the next step! One child from 12 to 18 years is charged EUR 25 per person per night when using existing beds. Sunrise Village Hotel - All Inclusive accepts these cards and reserves the right to temporarily hold an amount prior to arrival. 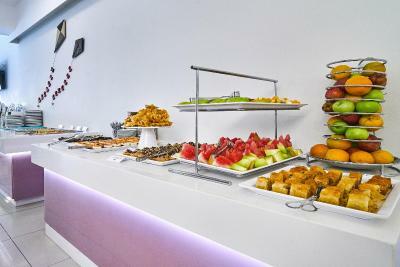 Please note that the all inclusive package features buffet breakfast, lunch buffet, dinner buffet, unlimited drinks and ice cream from 10:00 until 22:45. All-inclusive gluten-free meals can be arranged upon request. Please let Sunrise Village Hotel know your expected arrival time in advance, if you arrive after 21:00. You can use the Special Requests box when booking or contact the property. Guests are kindly requested to pay the total amount of reservation upon arrival. Please inform Sunrise Village Hotel - All Inclusive of your expected arrival time in advance. You can use the Special Requests box when booking, or contact the property directly using the contact details in your confirmation. We asked for a lunch box because we were going to be away all day and they put only one banana and one toast with a slice of ham and one slice of cheese per person...poor when you paid for all inclusive. Wifi connection is not great...the staff will tell you that this is due to traffic but other hotels don't have the same problems with connection. The only thing to suggest: when travelling with younger children, washing maschine and dryer that require coins to work would be very handy. But the hotel offers laundry service so that is not a problem. We were group of five adults and four children and we all enjoyed our holiday in this hotel that has a good quality-price ratio. 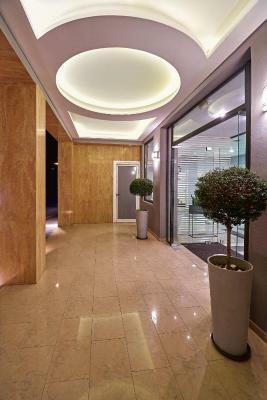 All premises were maintained carefully and personnel was friendly and helpful. Timetable of all inclusive program was reasonable. 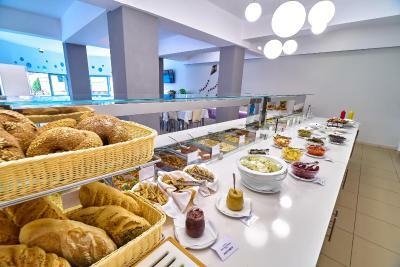 Breakfast was served 8.00-10.00. Pool bar was open 10.00-18.00 offering drinks, pizza slices, fruits, ice cream and there was also possibility to make your own toast with ham and cheese. Lunch time was 13.00-14.30 and dinner 19.00–21.00. 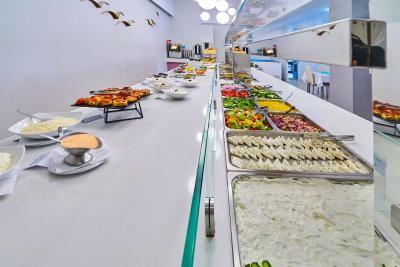 There was always a separate kids buffet with french fries and pizza slices and third option as hamburgers, hot dogs, fish sticks or potato nuggets. 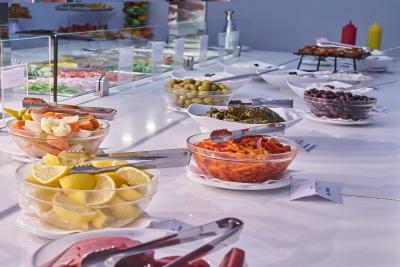 But there always was easy food for children also in the main buffet (as pasta and potatoes). There were always many options and enough variation. There were different amusing theme nights: on Monday a magician, on Wednesday Greek dancers, on Saturday piano music with singing. If I understood right the bar closes at 22.45. So we slept well as there was no noise during the night. For party people there are lots of bars nearby. 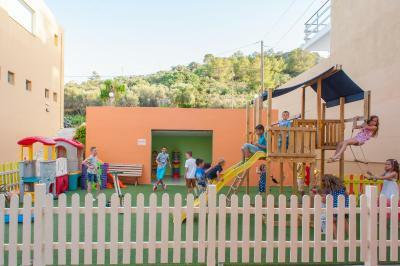 For families with children, there is also a fun park near the hotel. 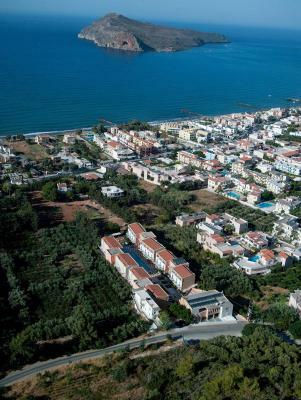 There are different beaches in the area of Platanias and Agia Marina. Some are a bit rocky, some have only fine sand, some get deeper quicker and some are very shallow. For example in the area of Gorgona Beach the beach is sandy without rocks and is also very shallow. We had beach days with very calm sea but also couple of days with very big waves because of northern winds (then it is not possible to swim actually, but in Agii Apostoli the sea is calmer also on those red flag days). Bus stop to Chania is maybe 400 meters from the hotel and costs only 1,80 eur. There are boat trips from the harbour of Platanias and station for Little Fun Train is also close. Many supermarkets also nearby. Very very slow WiFi, pool was cold, 10 minutes walking up and down the hills, hard with old people, and small kids. Would have liked to have seen the grassed area tidied up at the end of each day - always full of sunbeds and empty glasses. Better food options for children’s section - too much pizza and burgers with mustard. There is really not much not to like about. If you want complete privacy then this hotel might not be for you as it is widely chosen mostly by families with young kids and elders. With exception of our room, other either have joint balconies or do not have an optical barrier facing the pool. But we did not mind. Pool food i.e pizza is very cold. Pedal bins in kitchen way too small. Would have liked a dish cloth in kitchen so I could at least wipe down kitchen sink myself. Also main food in dining room is not hot enough. I think the heat for keeping it warm should be turned up a couple of notches. Wi fi very poor in bedrooms.